Don't miss out on this week's featured Summer Special at my Etsy shop! One FREE PAIR OF HAIR BOBBLES will be included with all purchases this week of $10 or more. 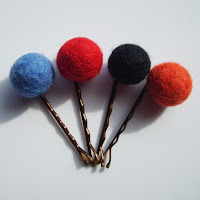 That's a little bit of free felted goodness to jazz up your hair! Please put "FREE HAIR BOBBLES" in the notes to seller at checkout as a gentle reminder for me to include them. Check out some examples of my little hair bobbles in the photos. 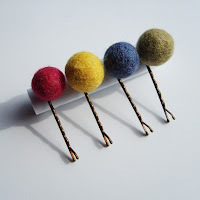 These are bobby pins with one of my hand felted wool beads attached to each. They are a cute accessory for anyone's luscious locks! Please note that these are only examples of my hair bobbles. The color and design of wool bead will vary for each free hair bobble.